How Do I Catch Up on My Retirement Savings? When you’re in your 20s, you feel like you have your whole life ahead of you. The word retirement makes you think of a gated community, golf carts and grey hair. Who cares about that stuff? But something happens when you turn 40. Your body starts to remind you that you’re not as young as you used to be. In fact, my knees remind me of that fact every day! And when you look at your future, you realize retirement is a lot closer than it used to be too. Use what you’ve got—your salary. Pay off your mortgage, and put that money toward investing. Opt for extra time in the workforce. Get help from a professional to maximize your investments. Mama Hogan used to say, “If it’s meant to be, it’s up to me.” In other words, if you want to change your future, you have to take action. You can’t wait on somebody else. But here’s the good news: If you’re smart and make changes in your saving habits now, you still have enough time to build wealth for that retirement of your dreams. Here’s how. According to the Employee Benefit Research Institute, one-third of workers age 45–54 have less than $10,000 saved for retirement.1 Let’s assume you’re at the top end of that spectrum with a $10,000 nest egg. That means you likely know the basics about retirement plans. You simply haven’t been making the most of them. Assuming you have no debt except for your home and an emergency fund to keep Murphy’s Law at bay, you need to take advantage of your retirement savings options by investing at least 15% of your income right away. Here’s where you can take advantage of your age: A higher salary usually comes with it. 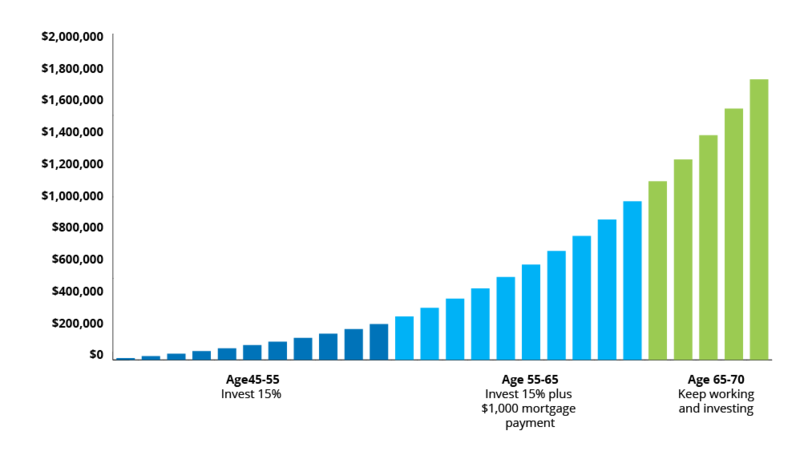 People age 45–54 are hitting their peak earning years, with the typical household income running a little more than $73,500 a year.2 If you invest 15% of that, you’ll be putting away $11,025 a year for retirement! In just one year, you’ve more than doubled your retirement fund. If you stay focused on that retirement dream and continue investing that amount every month for 20 years, you could have more than $762,000 for retirement! That’s the power of time and compound interest at work. A $315,000 Turnaround by Investing Your Mortgage! Don’t stop there! Focus on paying off your mortgage as fast as you can at the same time you’re investing 15% for retirement. Why get so intense? Because owning your home free and clear means you can enter retirement with a huge asset that’s separate from your retirement savings. More importantly, getting rid of your mortgage allows you to supercharge your investing. Let’s say you’re 45, making $73,500 a year and have a $1,000 monthly mortgage payment. For the next 10 years, invest 15% of your income for retirement and commit to paying an additional $500 a month on your mortgage. In that time, you could pay off a $145,000 mortgage while also building up your retirement savings to around $219,000. Now you’re 55. The house is yours free and clear, but retirement is right around the corner. It’s time to put the pedal to the metal. You increase the amount you save each month by $1,000—your old mortgage payment amount. Over the next 10 years, you could build your nest egg up over $970,000! In 20 years, your retirement vision becomes a reality instead of a pipe dream. You’ve got a paid-for home and a more-than-decent nest egg waiting for you. And that happened by staying focused on your long-term goal and working hard to get there. 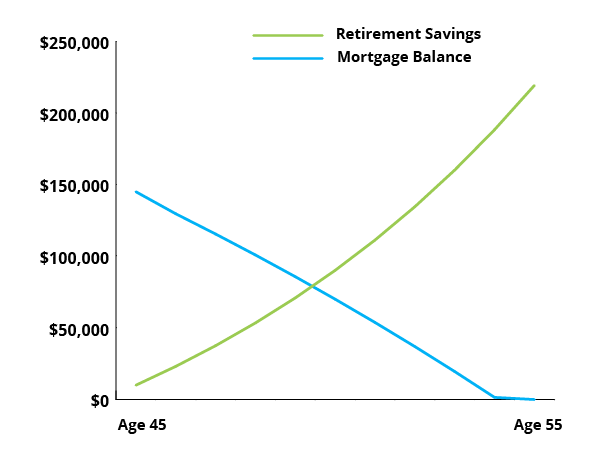 What if you kept saving and working until age 70? That gives compound interest five more years to do its thing. Working longer is not an option for everyone, but if you’re in good health and enjoy your job, staying longer is a great choice—not only for your mental health but your financial health as well. If you continue investing the same amount for the next five years, you could retire at 70 with more than $1.7 million! Catching up with your retirement savings isn’t easy. It’s aggressive, and you’ll have to work hard. You’ll have to make some significant lifestyle changes and forget about keeping up with the Joneses. You need to set your sights on that retirement dream, set concrete goals to move toward it, and do whatever it takes to reach it. Your first goal is to get help from a financial advisor. They can help you choose your investments and keep your plan on track as you get closer to that magic number. If you need help finding the right advisor for you, we have people who can help. The point is, you can do it—but you need to get started now. Don’t waste any more time living in regret. Leave the past where it belongs—behind you. Take action and change your retirement future today!